What if the emotion of grief wasn't the sadness of the emotional eater, but the sadness of the griever, grieving for the pig who never got to feel any happiness in his or her life? Lately I've been thinking about how we grieve, or don't grieve, for animals, and for which kinds of animals. I've started working on a new book about the subject because while it's clear that people who call themselves animal lovers grieve quite strongly for their own animals when they die (that's what the Rainbow Bridge was created for, after all), most people don't think at all about the billions of animals per year who die to fill our bellies. 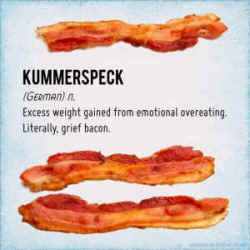 That's why I was struck by this image that has been floating around the Internet this week, and by the interesting German name associated with it: "Kummerspeck," which translates to, as the image says, "Grief Bacon." The idea is that for many people who overeat when they are stressed or unhappy, putting on weight in the process, that weight is called "grief bacon." It can just as easily be called "unhappy fat" or "sadness fat" since technically "speck" means fat (pig fat, actually) but "grief bacon" sounds more pleasing to the American ear, I think. But what if we turned around the notion of "grief bacon" and looked at it another way? What if, instead, we looked at bacon and felt grief for the dead pig whose life was taken in order to produce the bacon? What if the emotion of grief wasn't the sadness of the emotional eater, but the sadness of the griever, grieving for the pig who never got to feel any happiness in his or her life? 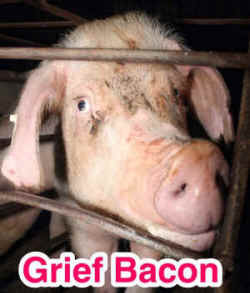 What if this was the new image that went viral with the words "Grief Bacon?"